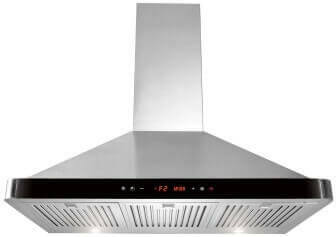 Add value and functionality to your kitchen with this Golden Vantage Classic Wall Mount Stainless Steel Hood Range. It features stylish European design and is made from high quality stainless steel. It has adequate light with two, 2-watt LED lights and has air flow of 760 CFM that will keep your kitchen clear of odors and smoke without producing a great deal of noise. It is easy to maintain with easy-to-remove anodized aluminum filters that can be cleaned in your dishwasher. It also features a non-return air flap that prevents heat from escaping when it is not being used. It looks stylish thanks to the brushed stainless steel finish and you can choose from three operating speeds, with the push button interface. 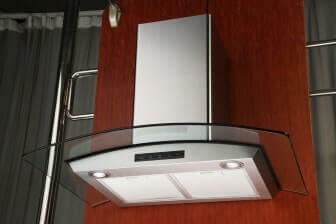 It also features a telescopic chimney that is designed for ceilings that are 8 to 8 ½ feet in height. It will also add to the look of your kitchen with its brushed stainless steel finish and you know you are getting a quality product as it is backed by a 3-year manufacturer's warranty. Installing this unit may be a chore for anyone who is not an experienced do-it-yourselfer. It is relatively heavy as it weighs in at 35 pounds, so it will take a stout man or woman to install it. You also want to add some extra supports as the drywall anchors are often weak with these units. 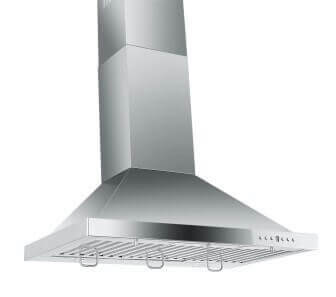 Golden Vantage is one of the top manufactures of Range Hoods, but this particular product stands out as it's one of the most inexpensive stainless steel hood ranges that you will find on the market today. Since the product is comparatively new, you won't find plenty of reviews out there. But, the few that are present are all praise. You can check them out yourself before you go ahead and place an order.